This 2 bed holiday apartment is located in the Puerto Jardin holiday complex, close to the centre of Puerto de Mazarrón and within walking distance of the beach and all amenities. RENTED This 2 bed 2 bath villa is on the resort of Mojon Hills, close to the village of Isla Plana. Set in the heart of the Mojon Hills complex, with stunning views to the sea. This new and modern villa is in the popular area of El Alamillo, just a short walk from the beach. With a private pool, terraces with sea views and a high standard of accommodation, it provides the perfect setting for a family holiday close to the town of Puerto de Mazarron. 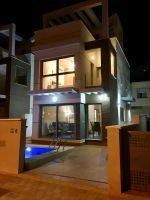 This delightful 2 bed villa is fully equipped for both holiday lets and longer term lets, with everything needed for a comfortable stay in the resort of Mojon Hills. This lovely 3 bed villa is close to the entrance of the Mazarrón Country Club complex, and is ideally suited to either holiday rentals or longer stays.